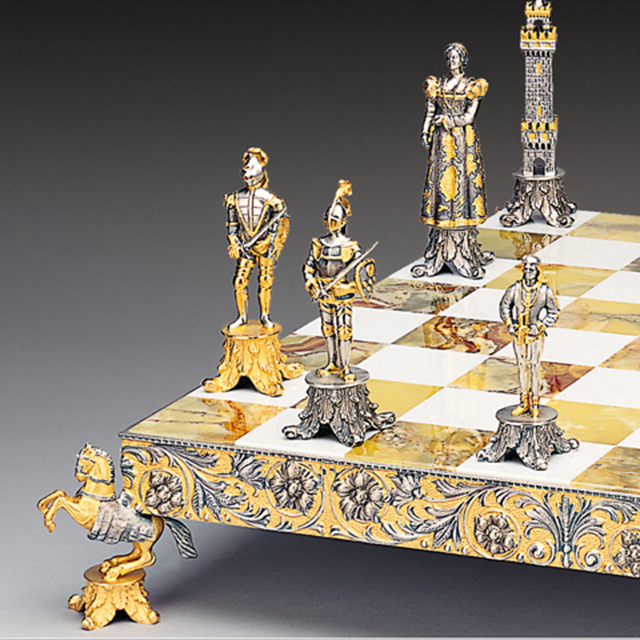 Unique Chess Set, made in Bronze, finished using real Gold 24 Karat. Each piece signed by his sculptor. Onix and Bronze hand made Chessboard, n° 2 tools included. 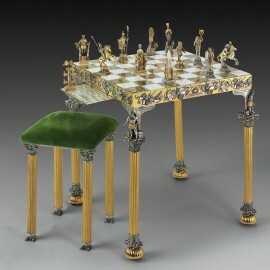 King: h. cm 32 – Table: cm 126×126 h. cm 73 – Square side cm 13. 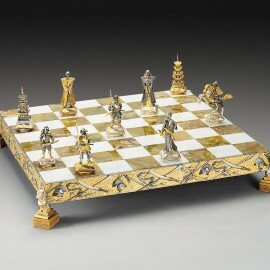 Unique Chess Set, made in Bronze, finished using real Gold 24 Karat. Each piece signed by his sculptor. Onix and Bronze hand made ChessBoard, n° 2 tools included. 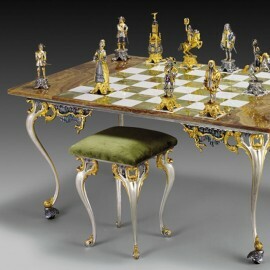 King: h. cm 22 – Table: cm 130×83 h cm 60 – Square side cm 10. 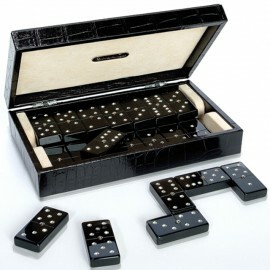 Wooden suitcase included for all chess sets. 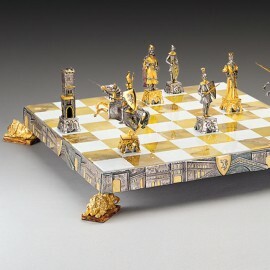 Unique Chess Set, made in Bronze by lost wax process tecnique, finished using Real Gold 24 Karat.Each piece is signed by the Sculptor. 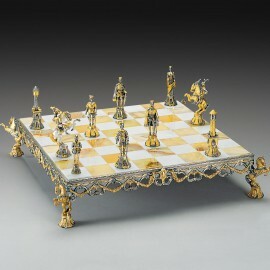 The Chess Board is made in Onix and Bronze with a frame in bronze and real gold. Stools not included in the price. 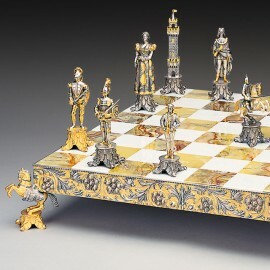 Florentine Renassaince XV Century chess set. The Vikings -Norse warriors of the period VIII- IX cent. 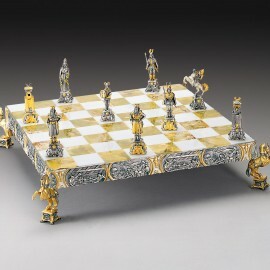 Unique Chess Set, made in Bronze by lost wax process tecnique, finished using Real Gold 24 Karat.Each piece is signed by the Sculptor.The Chess Board is made in Onix and Bronze with a frame in bronze and real gold. Medici vs Pazzi (1478, Florence). 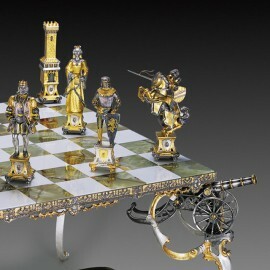 Unique Chess Set, made in Bronze, finished using real Gold 24 Karat. Each piece signed by his sculptor. 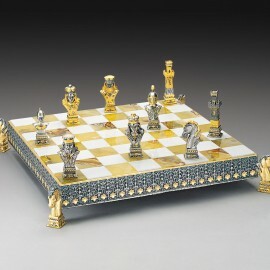 Onix and Bronze hand made ChessBoard. 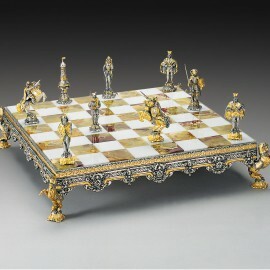 Size: Horse h. cm 18 – Chessboard: cm 63x63x9,5 – Square side cm 6,9. Brown leather or red crocodile printed leather case, cm 58x36x9. 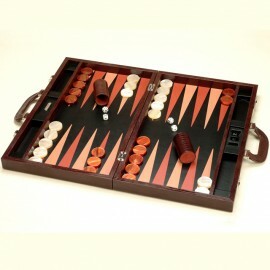 Playing surface: leather inlaid, pearled checkers mm 45. Available in all leather colours. Black or white crocodile printed leather, cm 24x14x6, original swarovski cristals. Avaliable in all leather colours.